These garlicky potatoes make a tasty side dish that go great with meat. 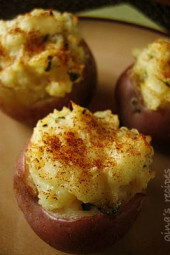 In a medium pot, cover potatoes in water and add 1 tsp of salt. Bring to a boil and cook until soft (about 12 minutes). Drain and run under cool water. Set aside. While the potatoes cook, in a small pan, add oil and garlic and cook on very low heat, about 12 minutes, till soft. Remove garlic and discard oil. In a medium bowl combine garlic, thyme, cheese, mayonnaise, sour cream, salt and pepper. Using a teaspoon, scoop out potato leaving 1/4 inch shell. 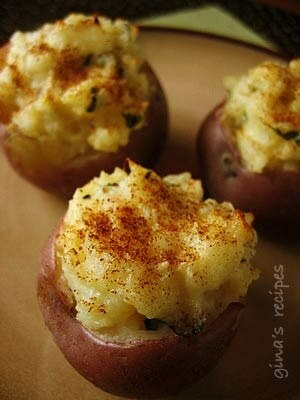 Mix the potato with the other ingredients and fill potato shells. I made them last night and they were sooo good!! These were good. Tip: Smaller potatoes are going to cook faster than the bigger ones. 12 or 13 minutes is fine for the small ones but you're going to need a few minutes longer for the bigger ones. The tricky part is not overcooking them – there is a VERY fine line between perfectly cooked and falling apart. I didn't have thyme so I used two teaspoons of dried parsley. YUM! Thanks for this! I made these tonight but I found there was too much thyme. I did however use smaller potatoes. I think even still I will only do 1 tbsp of thyme and maybe even substitute it for oregano or basil. Still love these recipes!!!! This is horrible! I boiled the potatoes like 3 times and they weren't soft enough. I didn't know that until I bent a spoon trying to get the 'soft' potato out of the skin. I gave up and threw it in the oven for 10 minutes at 350 degrees F. It's still not soft… maybe it's the potatoes you would say. But I disagree. has anyone made these without the mayo and sour cream? maybe substituting greek yogurt? How'd they come out? Would it be possible to make these without the mayo? It sounds fabulous otherwise! Planning to make these for Thanksgiving – can I prep these the day before, refrigerate overnight and then bake?? 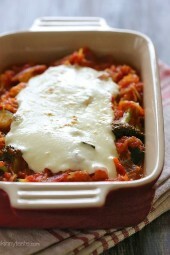 Love your blog…I have made several of your recipes already and they are always delicious. Santa Fe Chicken is a fan favorite in our house : ) Thank you!! Would it be ok to leave out the garlic or will it change the recipe too much? On a cookie sheet, but these are the old points, I will update this one this week. Do you bake them on a metal cookie sheet or a glass casserole dish? is the points for these point plus points? Wow these really are BLISS, I want to eat the whole lot of them! Thanks for a great website! I could not scoop out the insides without ruining the peel. LOL. I think I boiled them too long so they were too soft maybe? So instead I put it into a casserole dish and baked it. I had the same problem! I couldn't get the skins of the red potatoes withstand me scooping out the insides because the potatoes weren't quite cooked even after 20 minutes of boiling. What's the trick, here? 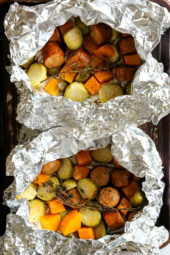 Do you think these could be prepped the night before, sit in the fridge overnight, and then baked for 20-30 minutes the next day? After it's cooked you scoop out the potato. Then refill it. Enjoy! Hi! Hoping to make these for thanksgiving. I'm new to cooking so this might sound silly…do you cut the potatoes in half before or after cooking? @sarah- the oil is used to cook the garlic, but then you discard it. So you wouldn't count it, you could use less if you want, either way, toss the oil when the garlic is cooked. Should I really be using 4 Tbsp of EVOO? I made these last night and they were a HUGE hit with my boyfriend's daughter (and with me, too!) I will be making these again. I love your recipes. I'm making the Creamy Cauliflower Puree for the first time tonight. Thanks. I made this for my parents and husband and I must say — THEY LOVED THEM! Looking forward to making them for the in-laws this weekend with the roasted chicken with rosemary and lemon 🙂 YUMMMMM! 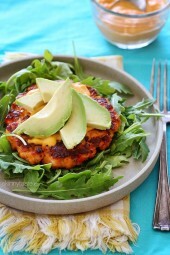 vow .. these would be g8 just as it is too !Veggie food never looked better ! those look great…I’m going to try them! The potatoes look great and all of your salads are so colorful! They are making me hungry!